You'll have no doubt seen this one advertised on the tube by now. Dubbed 'Yellow', it's said to be the artist's most popular piece of work. 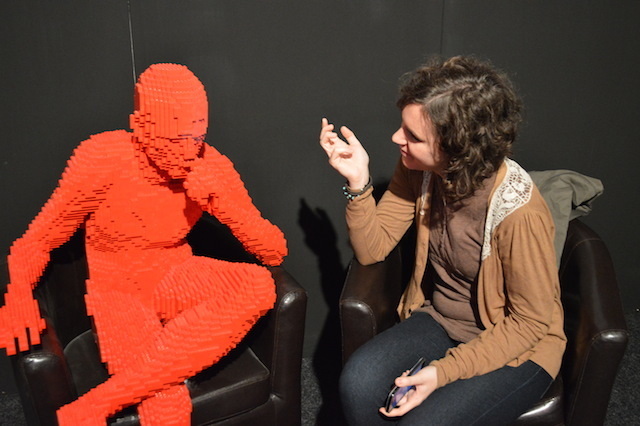 Londonist Silvia (she's the one on the right), interviews Red Guy Sitting at the exit. A trio of face masks. Cracked. 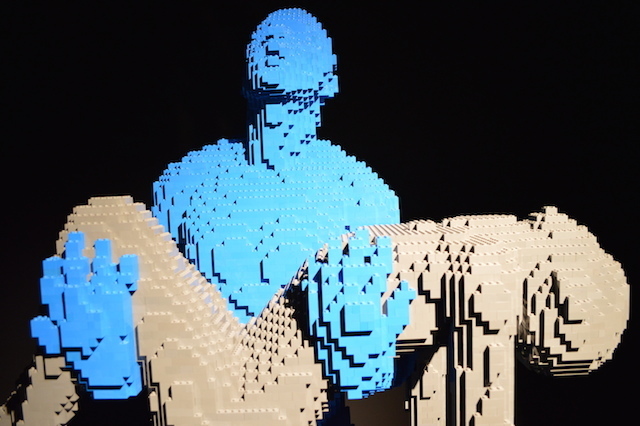 Looks impressive, but now imagine how you'd plan and build such a thing from Lego. My Boy...one of numerous pieces that deal with loss or pain. 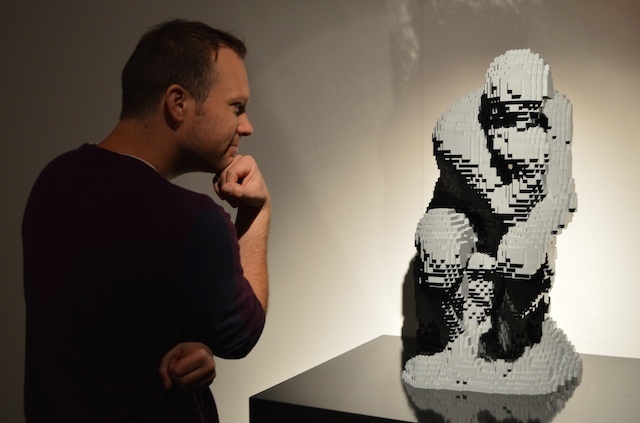 Londonist Stu ponders a Lego Rodin. Dinosaur skeleton. We dubbed him Tyrannosaurus Brix. 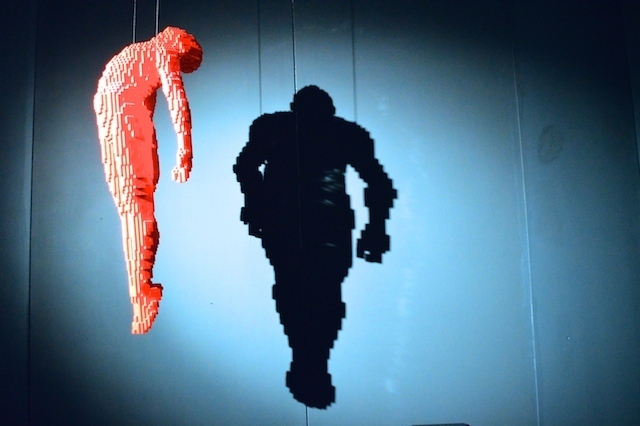 Ascension is one of several pieces to cast impressive shadows. 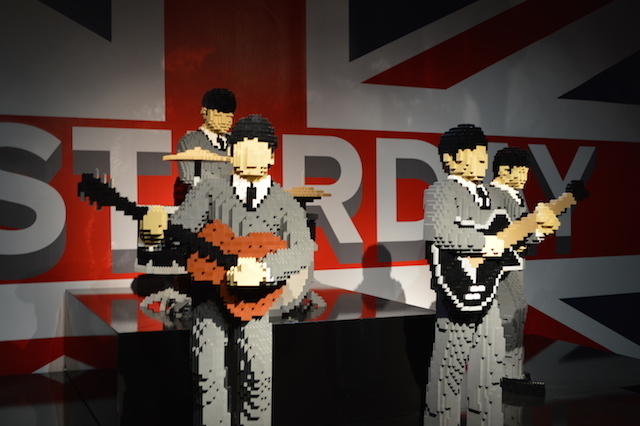 The Fab Four have us grasping for Lego Beatles puns. I Want To Build Your Hand? Norwegian Plastic? Brick-it to Ride? We'll stop there. Sing. The artist gets crotchety. 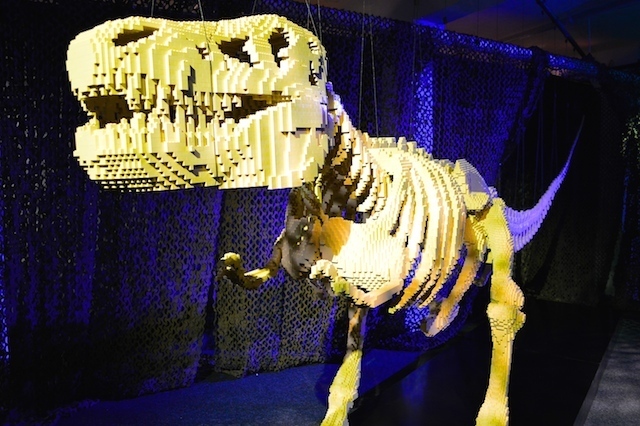 London's seen its fair share of Lego exhibitions in recent years. 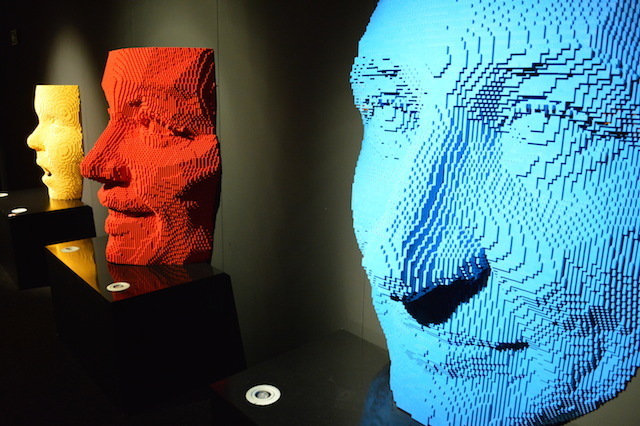 So what can bricksmith Nathan Sawaya give us that we haven't seen before? Buckets of dark, playful fun that has some credibility as 'proper art', that's what. The show opens with a decidedly awkward introductory video, filled with slick Troy McClure patter and life-affirming cliche. It all feels deeply at odds with the shabby-chic setting of Old Truman Brewery. There are few other bum notes in this otherwise remarkable exhibition. 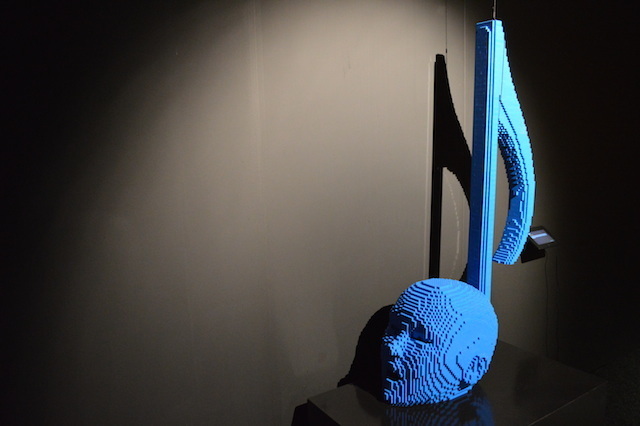 Sawaya's creations are legion, his skills remarkable, his patience unfathomable. 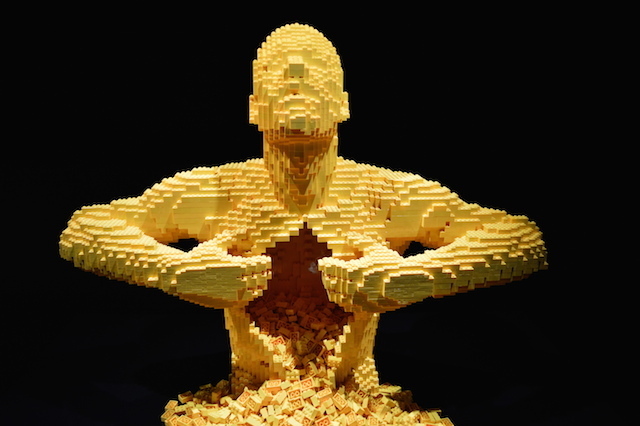 The first room throws up Lego recreations of ancient Greek sculpture. This is followed by plastic versions of famous canvases. 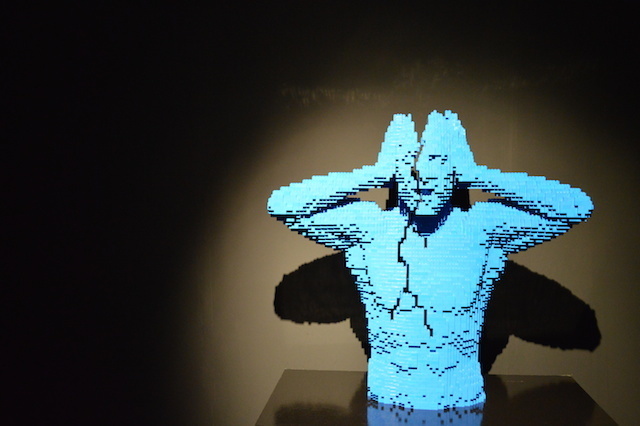 A succession of chambers then offers a mix of figurative sculpture, often with surreal or macabre undertones. Bodies twist into improbable conformations; they split, elongate or — as in the main publicity image — rip themselves open. We're reminded at times of Gunther von Hagens's Body World exhibition, which the Truman Brewery hosted a decade ago. This zoo of styrene grotesques ends on a lighter note, with a gallery of British icons. The Beatles and One Direction share space with a red phone box and Keep Calm notice. After so much brickish bodyshock, it feels like a tortured psyche finally letting his hair down. Some might receive further shock at the price. The cheapest adult ticket is £14.50 (£16.50 if you visit at the weekend) for an exhibition that takes about 45 minutes. That cost must cover a brick shithouse of overheads, like shipping over so many delicate creations from the US and, of course, rewarding the artist for his huge time investment. 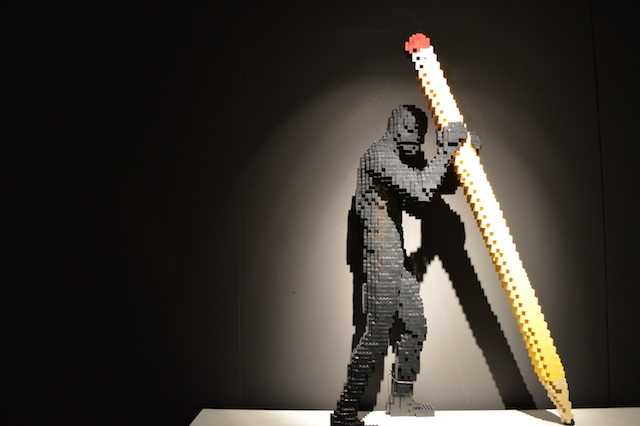 Such is the popularity of Lego, and such is the calibre of the work on show, that we have no doubts they'd sell this one out at double the price. Shame, though. 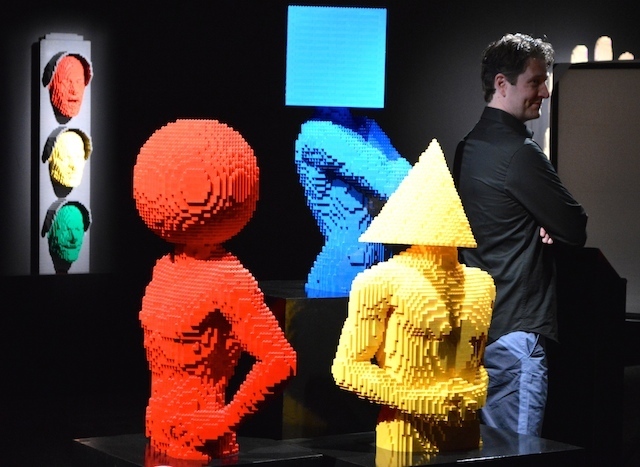 The Art of the Brick is on at Old Truman Brewery from 26 September 2014 to 4 January 2015 EDIT: The exhibition has now been extended until 12 April 2015. Entrance opposite Rough Trade East, appropriately enough near Brick Lane.